My dear friend, Claudia Daniel, is an artist extraordinaire. She is also the Godmother to our son, Andrew. Lucky boy. Specializing in fine Catholic art, specifically iconography, Claudia produces magnificent art that is available for purchase or by commission. 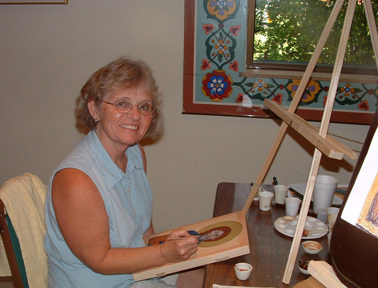 Much of her work is done with real gold leaf, resulting in spectacular images. Claudia's art makes great gifts for special occasions - Baptisms, First Communions, Weddings, and more. To view a smattering of Claudia's work, click here. If you are interested in purchasing Claudia's art for home, church, or business, please contact me. I will put you in touch with Claudia. View some of Claudia's work. Inquire about Claudia's art or commission a piece.